Our Integrated Drought Reduction Program (IDRP) focuses on tropical regions and reduces the impact of drought for humans, agriculture and cattle. Our IDRP offers support to prevent rainwater to flush away easily. Our actions are focusing on increasing the capacity of the earth to replenish the ground water aquifer. We advise to undertake additional action so reach a long term sustainable water situation and we focus on locating sustainable water shops in the area, start a WASH program, involve woman actively and raise awareness on hygiene and sanitation. 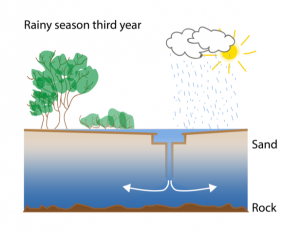 We use geophysical- and geomorphological-techniques to locate permeable layers in the subsoil were rainwater can be trapped. 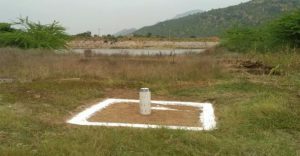 Once that is done, areas are flattened, small dams are constructed and boreholes drilled and filled with course gravels. Once the rains emerge, the water will be sinking down into the ground through these boreholes. The diagrams here after give an idea how the IDRP works over time. The advocated method has been proven successful is Asian and African countries. More than 130 boreholes are installed so far, 18.000 farmers improved their livelihood and 100.000 families were supported to gain food security as a result. 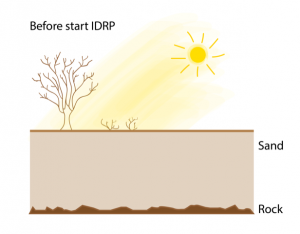 Where and when does the IDRP work? 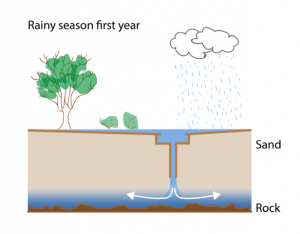 Our technology is dependent on rain to arrive and limited to those places were sandy coarse layers can be located in the subsoil less than100 meter deep. Let us know if you are interested to know more about his solution.